The higher authorities had relesed the latest HAL Recruitment 2018 Notification For 42 Vacancies of Aircraft Technician, Air Traffic Controller Trainee posts. Applicants who are interested for hal-india.co.in Jobs 2018, they can apply from 28th December 2018 to 11th December 2018 (Aircraft Technician), and 19th December 2018 (Air Traffic Controller Trainee). In the bekow sections we had arranged the complete details about the HAL Recruitment 2018 such as educations qualification, sleection process, age limit, set of instructions to apply, and others. At the end of this page, we had attached the direct PDF link to download the Hindustan Aeronautics Limited Advertisement 2018. Applicants must complete their Diploma or Engineering in the respective field from any recognized institute or University in India. Minimum three years of work experience on Aircraft in Indian Force/ Navy/ Army after acquiring diploma qualification. A Candidate who is applying for HAL Recruitment 2018 , they must have to check the details of Age limit. The age limit will be as per the rules and regulations of the Dr. YSR Horticultural University. Not above 28 Years as on 19.12.2018 for General candidates. Upper age limit is relaxable by 5 years in respect of SC/ST and 3 years for OBC candidates. The higher authorities of Hindustan Aeronautics Limited had provided the complete details about selection process for the given vacancies. Every applied candidate must and should have to attend for the Selection Process For HAL Aircraft Technician, Air Traffic Controller Trainee Vacancies 2018. The higher vauthorities will give the salary for all the candidates who had got selected in the HAL Recruitment 2018 according post. Check our site Sarkari Recruitment for more updates. No Fee for Aircraft Technician. Rs. 500/- (Rupees Five Hundred Only) along with the bank charges (as applicable), which is non- refundable (Exempted in case of SC/ST Candidates). First of all, applicants have to visit the official site of Hindustan Aeronautics Limited that is hal-india.co.in. In that go to the Careers section which is at top right of the home page. The other page will open. Search for the flashing link of HAL Recruitment 2018 according to post-wise. Download the HAL Recruitment 2018 Notification. 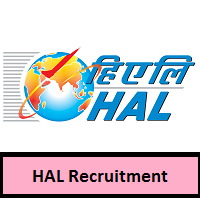 Read the entire details in the HAL Recruitment 2018 Notification. If you are eligible, then apply for the HAL Recruitment 2018. Fill the details in the HAL Recruitment 2018 application Form correctly. Verify the details in the form again. Take two or more copies of HAL Recruitment 2018 for further reference.